What a gorgeous book - fingers crossed! I'm planning to start quilting again next year so this would be perfect for me. This is a wonderful prize. thanks very much! Awesome, that book has been on my wish list. I haven't done a swap yet but have been thinking I would love to get into some in the new year. What a great idea for a book - clever thinking! Thank you fir this give away. This is on my wishlist, so fingers crossed on a win. Book is on my wish list! What a great item to share in the big giveaway. Thank you. I have been eyeing this book. Thanks for the giveaway! I have been shy thus far about swaps and bees so maybe this book would help build my confidence! Ooh what a great book to give away. Thank you so much for the chance. This has been on my wish list! would love to win this book..thanks for the chance! this looks like a good lifter. Would absolutely love this! Thanks! That book looks like fun! I just finished my first swap. This would be great for inspiration! I have had my eye on this book for a while. :) Thank you for the chance to win and congrats on being a contributor! I've heard so many great things about this book! Thanks for the chance to win! I have just signed up for my first bee, so what a fabulous book this would be to have for it. WOW! this looks like a great book. Congratulations on your inclusion. Thanks for being part of the Giveaway Day. I have been drooling over this book ever since the preview came out! This book looks lovely. It has been on my wish list for a bit. Thanks for your generosity. Maybe this book could help me get over my fear of swaps! I have been wanting this book ever since I first saw it so I would love to win! Congratulations by the way on being one of the contributors - that is very cool! I would love this book! Thanks for helping to make this giveaway such a success. I'd love to win this book. Thank you! This book sounds very interesting! Thanks so much for giving me the chance to win it! Count me in please! Thanks for such a great giveaway. This book is on my wish list! You can tell by the cover it looks like a great book! It's a book on my Amazon wish list! I've seen this book online a lot recently & have been curious about it. Thanks for the giveaway. Looks like a great book - thanks for sharing! Lovely giveaway, this book is on my wishlist. I've had this book on my wish list for some time now so hopefully I'll be the lucky winner! I just know this is full of all sorts of eye candy. Please excuse me now while I daintily wipe the corner of my mouth. A great topic I would love to learn more about. Thank you for the giveaway! Thanks for the chance at the book. Yes! I love your book. I want it. Badly. love your blog! felt like I got to go to sewing summit through your pictures. thanks for the giveaway! sweet! If i win, I'll keep a copy of what I like and host a giveaway on my blog! share the love! I really like the look of this book & the reviews I've read are all really positive. Thanks for such a lovely giveaway. How exciting to have contributed to the new book! Thank you for a generous giveaway. This book looks awesome, and I love your blog! Thanks for the chance! This looks like a wonderful book-- I've read several blog posts from some of the contributors and am definitely intrigued! Thanks for offering this giveaway== you are very generous! Happy holidays to you! Wonderful giveaway. This book would be a great addition to my craft room. Thanks for the chance at your giveaway. this is on my wish list, so if I don't win it or get it for Christmas, I guess I will have to buy it for myself. Congratulations on being part of a great book. great giveaway, hope to win!! What a great giveaway. I would be very excited to win. This looks like a really great book! Thanks for sharing! This would be majorly inspiring. I'd love to see this incorporated into my sewing life ! Thanks for sharing a copy - I'd love this book! Oh a craft book! Yay! Thanks for the opportunity to win it. I know you're not supposed to judge a book by it's cover, but I say, why not?? Make a great cover, convince me to read it! And yours is great; that looks like a fantastic book. I would love to win this book. Thanks for the giveaway. I'm surprised I hadn't seen this book yet, and glad to have discovered it today - it looks lovely! Thank you for the opportunity! Would love to have a copy of this book.. I have never done a swap . . . maybe I would be braver if I read about it first! I'm a bit of a beginner at this quilting thing and so a book would especially helpful, I imagine! This is a great choice for a giveaway - with so many swaps going in sometimes you need a little inspiration! Thanks for the chance! Ooooh, I have definitely been wanting this book. I just got into doing swaps on Flickr and I am having a blast. thanks for a great giveaway! book looks great! I'd love to win this book. Pretty hexies on the front, and I love hexies. Greetings from Norway! What a great giveaway!! You are so generous. Merry Christmas. Thanks so much for the chance! What a great book! Fantastic book! Looking forward to more patterns and books this year and this is one of them. Thanks! Awesome. I wanted to check out this book. It looks like it holds some pretty gorgeous projects. Fantastic giveaway!!! Thanks for the chance to win. I would love to have this book. 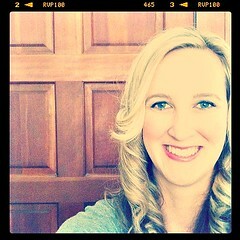 My friend Kelly is also a contributor. been too scared to participate on a swap yet this book would be great! I've been wanting this book since I saw it on several other websites! It sounds like a neat concept...Thanks! 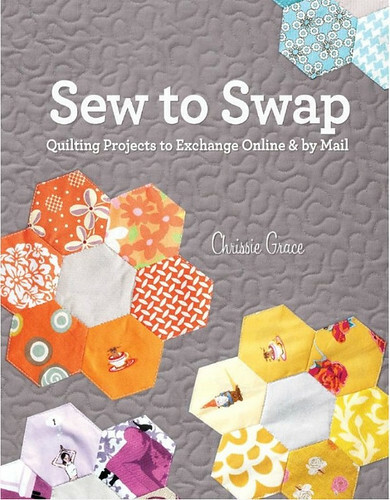 I'm addicted to swaps so I'd love a copy of this book! The book looks like a lot of fun! Thank you for the giveaway! I have seen this book mentioned on a few blogs and it looks fabulous! Thanks for such a great giveaway! Looks like a cool book. Thanks for the chance to win it! i could always use a new book for inspiration- thanks! Looks like a cool book I would love to have! This book looks wonderful. Thanks and Merry Christmas! What a fun book! THANKS for the chance! Super! That books looks wonderful. I would just LOVE this book! Thanks for the giveaway. fab book, I have seen snippets in lots of the blogs that I follow! i'd love to learn more about online swaps! i'm relatively new to sewing & quilting, and that looks like a really fun way to jump in. thanks for the chance! That book has been on my list! Thanks for the giveaway! Thanks for a brilliant giveaway, I have my fingers crossed. Oooh, I would love to win a copy of this book! Hi thanks for a chance to win this book, I just love books. Great blog too by the way. Book looks great. Would love to win. Thanks for the giveaway. I've been eying this book! This is a great book you're parting with! I love swaps and currently am participating in a fabric postcard swap through Yahoo: Trading Fabric Postcards. I also do other non-fabric swaps but try to include some fabric in them if possible! Wow! I could really learn a lot from this! That looks like such an awesome book - I love swaps!